Roomi M.W., Kalinovsky T., Roomi N.W., Rath M., Niedzwiecki A. Summary. Aim: A nutrient mixture (NM) containing ascorbic acid, lysine, proline and green tea extract has exhibited anticancer activity in vitro and in vivo in a number of cancer cell lines. We investigated the effect of NM on human leukemic myeloid U-937 cells in vitro by measuring: cell proliferation, MMP expression, invasion, apoptosis, and COX-2 and COX-1 protein expression. Methods: Human leukemic cell line U-937 (ATCC) was cultured in RPMI medium supplemented with fetal bovine serum and antibiotics. After 24 h, the cells were treated with NM at 0, 50, 100, 250, 500 and 1000 Ојg/ml, in triplicate at each dose. Phorbol 12-myristate 13-acetate (PMA), 100 ng/ml was added to cells to induce MMP-9 secretion. Cell proliferation was evaluated by MTT assay, MMP expression by gelatinase zymography, invasion through Matrigel, apoptosis by using live green caspase detection kit (Molecular Probe), and COX-2 and COX-1 expression by Western blot. Results: NM had no effect on U-937 cell growth at a concentration of 250 Ојg/ml and exhibited an antiproliferative effect at 500 Ојg/ml concentration. Zymography did not demonstrate MMP-2 or MMP-9 secretion in normal cells; however, PMA strongly induced MMP-9, which was inhibited by NM in a dose-dependent manner. Cell penetration through Matrigel was significantly reduced (by 95%) at 250 Ојg/ml NM and completely blocked at 500 Ојg/ml NM. NM induced slight apoptosis at 100 Ојg/ml and moderate at 500 and 1000 Ојg/ml concentration. NM inhibited COX-2 expression in a dose-dependent fashion and had no effect on COX-1 expression. Conclusions: Our results suggest that NM has potent inhibitory effects on U-937 cell growth and expression of inflammatory mediators, significant parameters in AML progression. Abbreviations used: AML – acute myeloid leukemia; COX – cyclooxygenase; ECM – extracellular matrix; EGCG – epigallocatechin gallate; GTE – green tea extract; Gulo – gulonolactone oxidase; MMP – matrix metalloproteinase, NM – nutrient mixture; PMA – phorbol 12-myristate 13-acetate. Numerous studies document the effectiveness of natural approaches using herbs, vitamins and other nutrients in treating cancer and suggest that consumption of a plant-based diet has preventive effects on cancer development and its progression [1, 2]. Furthermore, naturally occurring plant compounds have shown significant potential for cancer prevention and treatment in preclinical studies and clinical trials [3—5]. Focusing on common pathomechanisms of cancer growth, invasion, and metastasis, Dr. Rath and Pauling  developed a new approach to therapeutic use of micronutrients to control cancer, by controlling invasive parameters of cancer progression, such as matrix metalloproteinase (MMP) and enhancing the structural stability of the extracellular membrane . Utilizing the principle of synergy, we formulated a combination of micronutrients (NM) including lysine, proline, ascorbic acid, and green tea extract (GTE), among others, which exhibited anti-tumor activity both in vivo and in vitro against a broad spectrum of cancer cell lines, including inhibition of tumor growth and metastasis in vivo and modulation of cell proliferation, MMP secretion, invasion, angiogenesis, and induction of apoptosis [7, 8]. Our main objective was to study the antitumor effects of nutrient mixture (NM) on human myeloid leukemia cell line U-937 in vitro by measuring: cell proliferation, MMP expression, Matrigel invasion, and apoptosis. 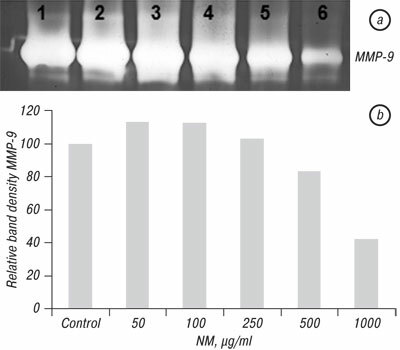 We also studied the effect of NM on cyclooxygenase (COX)-2 and COX-1 protein expression by U-937 cells. The human cell line U-937, which originated form the pleural fluid of a patient with diffuse histiocytic lymphoma, was selected for our study, since the cell line is homogenous and has proved a useful model for cellular study of myeloid leukemia parameters. Cancer cell line and culture. Human leukemia cell line U-937 was obtained from ATCC (American Type Culture Collection, Rockville, MD). U-937 cells were cultured in RPMI medium supplemented with 10% fetal bovine serum, 100 U/ml penicillin and 100 Ојg/ml streptomycin. The media and sera used were obtained from ATCC, and antibiotics (penicillin and streptomycin) were from Gibco BRL, Long Island, NY. Cells were seeded at a concentration of 106 cells/ml and cultured in the presence of 40 ng/ml phorbol 12-myristate 13-acetate (PMA) at 37 В°C in a tissue culture incubator equilibrated with 95% air and 5% CO2. After 48 h incubation, the cells were gently washed and treated with the NM, dissolved in medium and tested at 0, 10, 50, 100, 500, and 1000 µg/ml in triplicate at each dose. The plates were then returned to the incubator. This procedure was adopted for subsequent analyses: MTT, gelatinase zymography, Matrigel invasion, apoptosis, and western blot. PMA, 100 ng/ml, was added to cells to induce MMP-9 secretion. Composition of the NM. The NM was composed of the following in the ratio indicated: vitamin C (as ascorbic acid and as Mg, Ca, and palmitate ascorbate) 700 mg; L-lysine 1000 mg; L-proline 750 mg; L-arginine 500 mg; N-acetyl cysteine 200 mg; standardized GTE (derived from green tea leaves, was obtained from US Pharma Lab; the certificate of analysis indicated the following characteristics: total polyphenol 80%, catechins 60%, epigallocatechin gallate (EGCG) 35%, and caffeine 1.0%); 1000 mg; selenium 30 µg; copper 2 mg; manganese 1 mg.
MTT assay. Cell viability was evaluated by MTT assay, a colorimetric assay based on the ability of viable cells to reduce a soluble yellow tetrazolium salt [3-(4,5-dimethylthiazol-2-yl) 2,5-diphenyl tetrazolium bromide] (MTT) to a blue formazan crystal by mitochondrial succinate dehydrogenase activity of viable cells. This test is a good index of mitochondrial activity and thus of cell viability. After 24 h incubation, the cells were washed with phosphate buffered saline (PBS) and 500 µg of MTT (Sigma #M-2128) 0.5 mg/ml in media was added to each well. After MTT addition (0.5 mg/ml) the plates were covered and returned to the 37 В°C incubator for 2 h, the optimal time for formazan product formation. Following incubation, the supernatant was carefully removed from the wells, the formazan product was dissolved in 1 ml DMSO, and absorbance was measured at 570 nm in Bio Spec 1601, Shimadzu spectrometer. The OD570 of the DMSO solution in each well was considered to be proportional to the number of cells. The OD570 of the control (treatment without supplement) was considered 100%. Gelatinase zymography. Gelatinase zymography was performed in 10% Novex Pre-Cast SDS Polyacrylamide Gel (Invitrogen Corporation) in the presence of 0.1% gelatin under non-reducing conditions. Culture media (20 mL) were mixed with sample buffer and loaded for SDS-PAGE with tris glycine SDS buffer, as suggested by the manufacturer (Novex). Samples were not boiled before electrophoresis. Following electrophoresis the gels were washed twice in 2.5% Triton X-100 for 30 minutes at room temperature to remove SDS. The gels were then incubated at 37 В°C overnight in substrate buffer containing 50mM Tris-HCl and 10mM CaCl2 at pH 8.0 and stained with 0.5% Coomassie Blue R250 in 50% methanol and 10% glacial acetic acid for 30 minutes and destained. Upon renaturation of the enzyme, the gelatinases digested the gelatin in the gel, producing clear bands against an intensely stained background. Protein standards were run concurrently and approximate molecular weights were determined by plotting the relative mobilities of known proteins. Luminescence of gel bands was obtained using Photoshop histogram analysis. Matrigel invasion. Invasion studies were conducted using Matrigel (Becton Dickinson) inserts in 24-well plates. Suspended in medium, U-937 cells were supplemented with nutrients, as specified in the design of the experiment and seeded on the insert in the well. Thus both the medium on the insert and in the well contained the same supplements. The plates with the inserts were then incubated in a culture incubator equilibrated with 95% air and 5% CO2 for 24 h. After incubation, the media from the wells were withdrawn. The cells on the upper surface of the inserts were gently scrubbed away with cotton swabs. The cells that had penetrated the Matrigel membrane and migrated onto the lower surface of the Matrigel were stained with hematoxylin and eosin and visually counted under the microscope. Apoptosis. At near confluence, U-937 cells were challenged with NM dissolved in media at 0, 50,100, 250, 500, and 1000 µg/ml and incubated for 24 h. The cell culture was washed with PBS and treated with the caspase reagent as specified in the manufacturer’s protocol (Molecular Probes Image-IT™ Live Green Poly Caspases Detection Kit 135104, Invitrogen). The cells were photographed under a fluorescence microscope and counted. Green-colored cells represent viable cells, while yellow orange represents early apoptosis and red late apoptosis. COX activity. 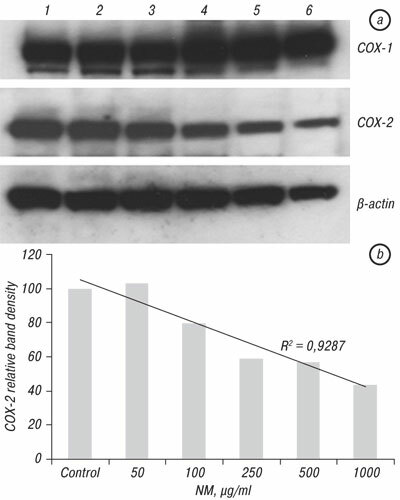 COX-1 and -2 proteins were determined by Western blot analysis using polyclonal antibodies against COX-1 and -2 (Santa Cruz Biotechnology, Inc, Santa Cruz, CA). Briefly, U-937 cells were grown, challenged with NM dissolved in media at 0, 50, 100, 250, 500, and 1000 µg/ml and incubated for 24 h. The cells were then lysed for 30 min in ice cold radioimmunoprecipitation (RIPA) buffer (50 mM Tris-HCl, pH 7.5, 10% Triton X-100, 1.0% Na-deoxycholate, 150 mM NaCl, 2 mM EDTA) (Teknova) with 1mM activated orthovanadate, and 1x Complete Mini Protease Inhibitor Cocktail tablet (Roche). Clarified cell lysates were denatured and equal proteins loaded and fractionated by SDS-polyacrylamide gel electrophoresis. After electrophoresis, the proteins were transferred to nitrocellulose membrane. The membranes were then incubated with the respective antibodies and developed by the enhanced chemiluminescence system (ECL, Amersham Pharmacia Biotech). Densitometry of COX-2 bands was obtained using ImageJ (National Institute of Health, Bethesda, Maryland), and relative band densities were graphed as percent of Control. Statistical analysis. The results were expressed as means + SD, as indicated in the results, for the groups. Data was analyzed by independent sample t-test. Pearson’s correlation coefficients were determined for invasion correlation to NM concentration using MedCalc Software (Markakerke, Belgium). Cell proliferation. 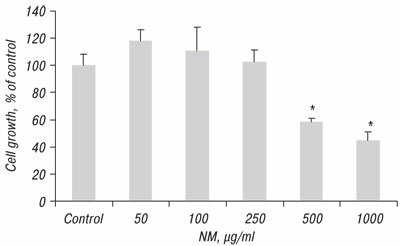 NM exhibited no effect on growth of U-937 cells in vitro at concentrations of 250 µg/ml and below, but exhibited 42% (p=0.001) inhibition of cellular growth over control at 500 µg/ml and 55% (p=0.0007) at 1000 µg/ml, as shown in Fig. 1. Gelatinase zymography. Zymography demonstrated no expression of MMP-2 or -9 by untreated U-937 cells and strong induction of MMP-9 with PMA treatment. 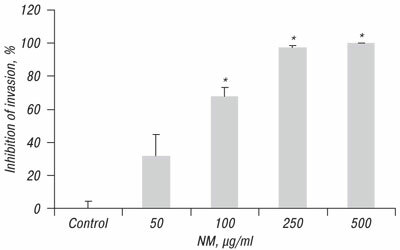 NM inhibited secretion of MMP-9 in a dose-dependent fashion, with 17% and 58% reduction of MMP-9 compared to control at 500 and 1000 µg/ml NM, as shown in Fig. 2. Matrigel invasion. NM significantly inhibited U-937 cell penetration through Matrigel in a dose-dependent manner, with 68% (p=0.0001) inhibition at 100 µg/ml, 97.6% (p<0.0001) at 250 μg/ml and 100% (p< 0.0001) at 500 μg/ml, as shown in Fig. 3 and Fig. 4, a–d. There was significant negative correlation between NM concentration and number of U-937 cells that invaded/migrated through Matrigel: r= -0.973, p<0.0001. Apoptosis (live green caspases detection kit). 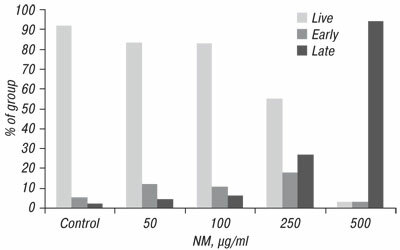 Using the live green caspase kit, dose-dependent apoptosis of U-937 cells was evident with NM challenge, as shown in Fig. 5, a-f. Approximately 17% of cells exposed to 100 µg/ml NM were apoptotic; the number of apoptotic cells increased significantly with increased NM concentration. Quantitative analysis of live, early and late apoptotic cells is shown in Fig. 6. At 100 µg/ml NM, 83% of cells were viable, 11% in early apoptosis and 6% in late apoptosis and at 250 µg/ml NM, 55% of cells were viable, 18% in early apoptosis, and 27% in late apoptosis. Virtually all cells exposed to 500 µg/ml NM were in late apoptosis: 3% viable, 3% in early apoptosis and 94% in late apoptosis. COX-1 and COX-2 activity. NM inhibited COX-2 expression in a dose-dependent fashion, with 20% inhibition at 100 µg/ml, 43% at 500 µg/ml and 54% at 1000 µg/ml, but had no effect on COX-1 expression (Fig. 7). In reviewing the potential roles of MMPs in acute myeloid leukemia, Hatfield et al. stated that in these cells, constitutive release of several MMPs and chemokines occurs, and there seems to be a crosstalk between the MMP system and the chemokine network. This crosstalk includes common regulation at the transcriptional level of MMPs (MMP-1 and -9) and constitutive release of several chemokines by AML cells, MMP-mediated structural alteration and release of chemokines involved in AML cell migration at the molecular level, and interaction at the functional level since both chemokines and MMPs play similar roles in such physiological processes as AML cell proliferation, migration and local regulation of angiogenesis . MMP-9 has been shown to be expressed by human AML cells and elevated MMP-9 levels were observed in serum and on the cell surface in the monocytic form of AML, suggesting the capacity of MMP-9 to regulate the invasive activity of monocytic leukemia . In our study, PMA-induced secretion of MMP-9 by U-937 cells was inhibited in a dose-dependent fashion, with 17% and 58% reduction of MMP-9 compared to control at 500 and 1000 µg/ml NM. Furthermore, NM significantly inhibited U-937 cell penetration through Matrigel in a dose-dependent manner, with 68% inhibition at 100 µg/ml, 97.6 at 250 µg/ml and 100% at 500 µg/ml. A critical process in neoplastic growth and progression in solid and hematological cancer is angiogenesis . The inducible enzyme COX-2 is an important mediator of both angiogenesis and tumor growth . Overexpression of COX-2 has been reported in hematological cancer models such as RAJI (Burkitt’s lymphoma) and U937 (acute promonocytic leukemia) [13, 14]. COX-2 modulation is a promising field investigated by many research groups. Giles et al reported significantly higher COX-2 levels in myeloid leukemic patients than in normal controls and correlation of increased COX-2 levels with significantly shorter survival . In our study, NM inhibited COX-2 expression in a dose-dependent fashion, with 20% inhibition at 100 µg/ml, 43% at 500 µg/ml and 54% at 1000 µg/ml, while having no effect on COX-1 expression. Furthermore, in a previous study, NM demonstrated significant antiangiogenic activity, as demonstrated in vivo by the chorioallantoic membrane (CAM) assay in chick embryos and by basic fibroblast factor (bFGF)-induced vessel growth in mouse Matrigel plug assay . In addition, in vitro, NM decreased the expression of pro-angiogenic factors, such as VEGF, angiopoietin-2, bFGF, platelet-derived growth factor (PDGF) and transforming growth factor (TGFОІ-1 by U2OS osteosarcoma cells in in vitro assay . U-937 cells are of the myeloid lineage and so secrete a large number of cytokines and chemokines either constitutively or in response to soluble stimuli. In a previous study on lipopolysaccharide-induced cytokine secretion in cultured U-937 macrophages, a combination of micronutrients was shown to inhibit COX-2 enzymatic activity and expression of pro-inflammatory cytokine proteins were down regulated by the nutrients at a transcription level complementing a blockade in NFkB activation . U-937 cell growth and apoptosis were also potently modulated by NM. The results of U-937 cell growth showed increased antiproliferative activity with NM dose, exhibiting 42% inhibition of cell growth at 500 and 55% at 1000 Вµg/ml NM. Inhibition of cell growth was associated with apoptotic cell death. 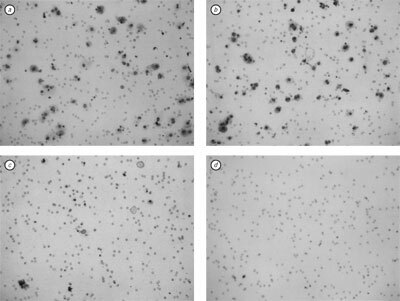 NM induced apoptosis of U-937 cells with 17% of cells apoptotic at 100 µg/ml, 45% at 250 µg/ml and 100% at 500 µg/ml. The NM was formulated by selecting nutrients that act on critical physiological targets in cancer progression and metastasis. Adequate supplies of ascorbic acid and the amino acids lysine and proline, are essential for optimal ECM formation and structure as these nutrients ensure proper synthesis and hydroxylation of collagen fibers. Lysine also contributes to ECM stability as a natural inhibitor of plasmin-induced proteolysis [6, 18]. Manganese and copper are also essential for collagen formation. GTE has been shown to modulate cancer cell growth, metastasis, angiogenesis, and other aspects of cancer progression [19-27]. N-acetyl cysteine and selenium have been observed to inhibit MMP-9 and invasive activities of tumor cells, as well as migration of endothelial cells through ECM [28-30]. Ascorbic acid has been demonstrated to inhibit tumor growth via antiangiogenic activity  and to inhibit cell division and growth in vitro through production of hydrogen peroxide . In a recent in vivo study of the effect of ascorbic acid supplementation on mice unable to synthesize ascorbic acid (Gulo KO mice) injected with melanoma B16 cells, ascorbate supplementation significantly reduced tumor growth and inflammatory cytokine secretion as well as enhanced encapsulation of tumors elicited by melanoma challenge in scorbutic mice . Arginine is a precursor of nitric oxide (NO); any deficiency of arginine can limit the production of NO, which has been shown to predominantly act as an inducer of apoptosis, as in breast cancer cells . Furthermore, we demonstrated that the combination of micronutrients in NM conferred superior anticancer effects than did equimolar concentration of EGCG found in NM . Investigation of the comparative effects of NM, GTE and EGCG on untreated and PMA-treated cancer cell lines (fibrosarcoma, hepatocellular carcinoma, glioblastoma and leimyosarcoma) with different patterns of MMP-2 and MMP-9 expression, demonstrated the superior inhibitory action of NM over GTE and EGCG on modulation of MMPs . The superior potency of NM over GTE and EGCG can be understood from the more comprehensive treatment offered by the combination of nutrients in NM over individual components of NM since MMP-2 and MMP-9 are mediated by differential pathways and suggests the importance of nutrients working in cooperation to more effectively treat complex biochemical pathways. Current treatment methods for AML are generally ineffective and toxic. Thus, there is a need for development of effective therapeutic agents for these cancers with minimal toxicity. Our studies demonstrated that NM significantly inhibited U-937 cell line MMP-9 secretion and Matrigel invasion, COX-2 expression, and cell growth and induced cell apoptosis, significant parameters in AML progression. The research study was funded by Dr. Rath Health Foundation (Santa Clara, CA, USA), a non-profit organization. Aldercreutz H. Western diet and Western disease: some hormonal and biochemical mechanisms and associations. Scand J Clin Lab Invest Suppl 1990; 201: 3—23. Miller AB. Diet and cancer: a review. Acta Oncologica 1990; 29: 87—95. Tan G, Gyllenhaal C, Soejarto DD. Biodiversity as a source of anticancer drugs. Curr Drug Targets 2006; 7: 265—77. Ruhal Amin ARM, Kucuk O, Khuri FR, et al. Perspectives for cancer prevention with natural compounds. J Clin Oncol 2009; 27: 2712—25. De Kok TM, van Brada SG, Manson MM. Mechanisms of combined action of different chemopreventive dietary compounds: a review. Eur J Nutr 2008; 47: 5—59. Rath M, Pauling L. Plasmin-induced proteolysis and the role of apoprotein(a), lysine and synthetic analogs. Orthomolecular Med 1992; 7: 17—23. Niedzwiecki A, Roomi MW, Kalinovsky T, et al. Micronutrient synergy — a new tool in effective control of metastasis and other key mechanisms of cancer. 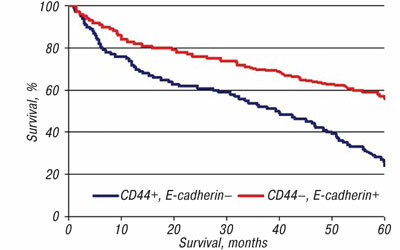 Cancer Metastasis Rev 2010; 29: 529—43. Roomi MW, Ivanov V, Kalinovsky T, et al. Inhibition of pulmonary metastasis of melanoma B16FO cells in C57BL/6 mice by a nutrient mixture consisting of ascorbic acid, lysine, proline, arginine, and green tea extract. Exp Lung Res 2006; 32: 517—30. Hatfield KJ, Reikvam, Bruserud Г. The crosstalk between the matrix metalloprotease system and the chemokine network in acute myeloid leukemia. Curr Med Chem 2010; 17: 4448—61. Paupert J, Monsat-De Mas V, Demur C, et al. Cell surface MMP-9 regulates the invasive capacity of leukemia blast cells with monocytic features. Cell Cycle 2008; 7: 1047—53. Bellamy WT, Richter L, Fruiger Y, et al. Expression of vascular endothelial growth factor and its receptors in hematopoietic malignancies. Cancer Res 1999; 59: 728—33. Gately S, Li WW. Multiple roles of COX-2 in tumor angiogenesis: a target for antiangiogenic therapy. Semin Oncol 2004; 31: 2—11. Nakanishi Y, Kamijo R, Takizawa K, et al. Inhibitors of cyclooxygenase-2 (COX-2) suppressed the proliferation and differentiation of human leukaemia cell lines. Eur J Cancer 2001; 37: 1570—8. Secchiero P, Barbarotto E, Gonelli A, et al. Potential pathogenetic implications of cyclooxygenase-2 overexpression in B chronic lymphoid leukemia cells. Am J Pathol 2005; 167: 1599—607. Giles FJ, Kantarjian HM, Bekele BN, et al. Bone marrow cyclooxygenase-2 levels are elevated in chronic-phase chronic myeloid leukaemia and are associated with reduced survival. Br J Haematol 2002; 119: 38—45. Roomi MW, Roomi N, Ivanov V, et al. Inhibitory effect of a mixture containing ascorbic acid, lysine, proline, and green tea extract on critical parameters in angiogenesis. Oncol Rep 2005; 14: 807—15. Ivanov V, Cha J, Ivanova S, et al. Essential nutrients suppress inflammation by modulating key inflammatory gene expression. Int J Mol Med 2008; 22: 731—42. Sun Z, Chen YH, Wang P, et al. The blockage of high-affinity lysine binding sites of plasminogen by EACA significantly inhibits prourokinase-induced plasminogen activation. Biochem Biophys Acta 2002; 1596: 182—92. Valcic S, Timmermann BN, Alberts DS, et al. Inhibitory effect of six green tea catechins and caffeine on the growth of four selected human tumor cell lines. Anticancer Drugs 1996; 7: 461—8. Demeule M, Michaud-Levesque J, Annabi B, et al. Green tea catechins as novel antitumor and antiangiogenic compounds. Curr Med Chem Anticancer Agents 2002; 2: 441—63. Hara Y. Green tea: Health Benefits and Applications, Marcel Dekker, New York, Basel, 2001. Mukhtar H, Ahmed N. Tea polyphenols: prevention of cancer and optimizing health. AM J Clin Nutr 2000; 71: 1698s—1702s. Yang GY, Liao J, Kim K, et al. Inhibition of growth and induction of apoptosis in human cancer cell lines by tea polyphenols. Carcinogenesis 1998; 19: 611—6. Taniguchi S, Fujiki H, Kobayashi H, et al. Effect of (-) epigallocatechin gallate, the main constituent of green tea, on lung metastasis with mouse B16 melanoma cell lines. Cancer Lett 1992; 65: 51—4. Wang X, Hao MW, Dong K, et al. Apoptosis induction effects of EGCG in laryngeal squamous cell carcinoma cells through telomerase repression. Arch Pharm Res 2009; 32: 1263—9. Kawakami S, Kageyama Y, Fujii Y, et al. Inhibitory effects of N-acetyl cysteine on invasion and MMP 9 production of T24 human bladder cancer cells. Anticancer Res 2001; 21: 213—9. Morini M, Cai T, Aluigi MG, et al. The role of the thiol N-acetyl cysteine in the prevention of tumor invasion and angiogenesis. Int J Biol Markers 1999; 14: 268—71. Yoon SO, Kim MM, Chung AS. Inhibitory effects of selenite on invasion of HT 1080 tumor cells. J Biol Chem 2001; 276: 20085—92. Rayman MP. Selenium in cancer prevention: a review of the evidence and mechanism of action. Proc Nutr Soc 2005; 64: 527—42. Schrauzer GN. Anticarcinogenic effects of selenium. Cell Mol Life Sci 2000; 57: 1864—73. Yeom CH, Lee G, Park JH, et al. High-dose concentration administration of ascorbic acid inhibits tumor growth in BALB/C mice implanted with sarcoma 180 cancer cells via restriction of angiogenesis. J Transl Med 2009; 7: 70. Maramag C, Menon M, Balaji KC, et al. Effect of vitamin C on prostate cancer cells in vitro: effect on cell number, viability and DNA synthesis. Prostate 1997; 32: 188—95. Cha J, Roomi MW, Ivanov V, et al. Ascorbate depletion increases growth and metastasis of melanoma cells in vitamin C deficient mice. Exp Oncol 2011; 33: 1—5. Cooke JP, Dzau VJ. Nitric oxide synthase: role in the genesis of vascular disease. Annu Rev Med 1997; 48: 489—509. Roomi MW, Monterrey JC, Kalinovsky T, et al. Comparative effects of EGCG, green tea and a nutrient mixture on the patterns of MMP-2 and MMP-9 expression in cancer cell lines. Oncol Rep 2010; 24: 747—57.